Won't You Be My Neighbor?, a documentary about the life and times of Fred Rogers of Mr. Rogers fame. For the past three years, we've partnered with Pop-up Stoneham to bring classics (The Incredibles, Hocus Pocus, and Ghostbusters) to the Stoneham Common for a family-friendly free night out. In 2018, we showed the 1925 Lon Chaney silent movie classic with LIVE accompaniment on the the newly refurbished 1930 Wurlitzer organ by renowned organist Clark Wilson. 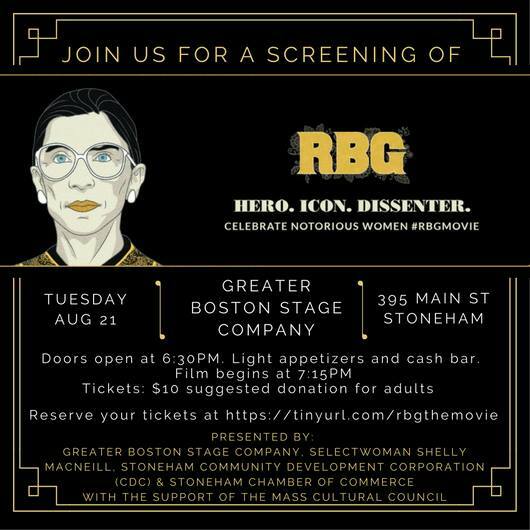 In 2018, we joined with Selectwoman Shelly MacNeill, the Stoneham Chamber of Commerce, the Stoneham Cultural Council and the Greater Boston Stage Co. to bring a showing of RGB to Stoneham. The film was about the life of Supreme Court Justice Ruth Bader Ginsburg.